Facebook hoax "Prayers for Like"
The message is a disgraceful hoax designed to get maximum number of likes for a facebook page and further promote it through sharing the message. A baby's photograph was taken out illegally from a personal facebook profile and is circulated without the parents permission. Unfortunately the baby from the photograph died two weeks after her birth. 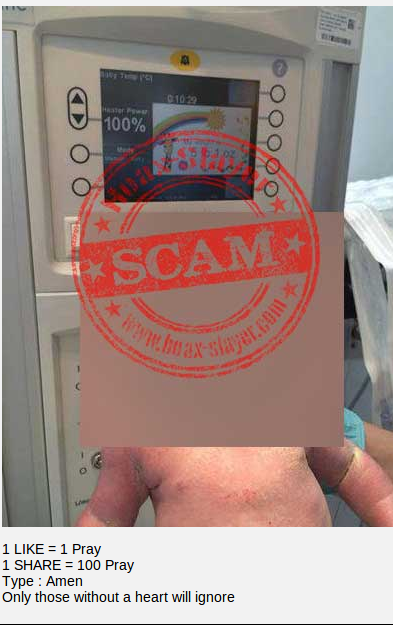 As the baby's picture is being circulated without the parents permission, it is causing great pain to them. If this hoax message comes your way, do not like or share it. Advisory, report this particular message to Facebook. According to the facebook's currently distributed hoax message, you can offer prayers to this baby girl by liking or sharing the picture. However, liking or sharing the particular message would not help the baby, infact would cause considerable distress to the parents and make them belligerent. The people who create these messages are highly motivated by the green eyed monster and look through the children whose pictures they misuse. Facebook pages with large number of likes are a source of black market and can also be sold to inhumane internet marketers and used to make further scam and hoax messages. Not only this it can also be seen on other pages including images of God and Godesses and they ask for a like or comment to seek There blessings.Well its ironical that even the Almighty now needs likes, shares and comments on their images for blessing the mankind.Huh.Well my suggestion is open up your eyes and think broadly. If this message comes your way, do not like, share or comment on such a post. It plays in favour of inhumane and immoral people who earn from such hoaxes. The company needs to take action that ensures that these scam messages are removed from the network as quickly as possible. Moreover, facebook has actually removed some of the messages, as they have been reported a number of times. The company should ensure that these hoaxes are removed from the network as quickly as possible.